Weddings and Parties Always Need a Private Event Bartender? Are you great at promoting and presenting yourself in a clean crisp, professional manner? Look at landing a job at a private party as an event bartender. If the nightclub scene is too much for you, dealing with a few happy customers at a wedding or anniversary might be much more satisfying. 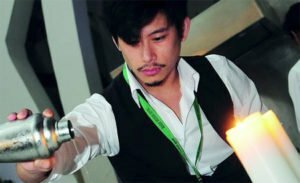 Succeeding in the catering and private party business depends on your cocktail knowledge, just like a craft cocktail bartender. Note that in addition to cocktail knowledge, and some witty banter, it also comes down to your networking abilities. You need to create connections in the bartending community and know how to effectively market oneself. Become that person that is in demand and run with it. Becoming an amazing event bartender sounds very simple but sometimes it comes down to answering an ad on Craigslist or meeting people at parties. Whether you have worked in the business a long time or you’re quite new, start making contacts. Peruse those classifieds or Craigslist ads. Be that guy or gal that people WANT as their bartender at any given event! An Event Bartender Always Need To Be Prepared! And not just prepared… but prepared for anything! Showing up looking proper and professional to an event is the best way to establish yourself as someone who is serious. You demonstrate that you are confident and ready. Looking the part is a huge thing and being able to interact with everyone, smile, laugh and enjoy yourself is a great way to land that next job. Talk to people as you serve them. Drink knowledge is key and cocktail recommendations are a great way to impress your guests. Always do your best to impress, because you want to make new contacts and you want to be in demand. A great checklist for yourself is: Show up with your own equipment, go out and buy all the tools you need to deliver a great product. Business cards, have them sitting out in a holder on the table or surface you are Bartending on. Also, go the extra mile, offer to help serve food if you have a minute, help clear dishes and help with clean up if need be. Good event bartenders look the part, work the part and go the extra mile. These are the kind of staff a host requires to ensure their party is a huge success. Make yourself available for people! Once you hand out cards and meet new people, the networking will snowball for you. If you say no, you will be replaced and forgotten just as quickly. Once you have established yourself in a group as a reliable mixer of cocktails, stick with them. Be their go to bartender! Keep in mind a lot of guests at private parties have different jobs. The connections you make at one party could lead to other business ventures as well, you never know, so mingle! Private Event Bartending is a great way to come out of your shell and interact with a great group of people who just want to enjoy themselves, usually in a smaller more intimate setting. Set that tone for them, smile, laugh with them and offer your services going forward. Private bartending is really luck of the draw most of the time, but the people you meet will make a lasting impression on your life. Get out there and promote yourself! We offer a Commercial Bartending Course 5 times a month. Check out all our available courses at Fine Art Bartending and Register Today. Add some extra cash to your wallet, and stories to last a lifetime, as an event bartender!